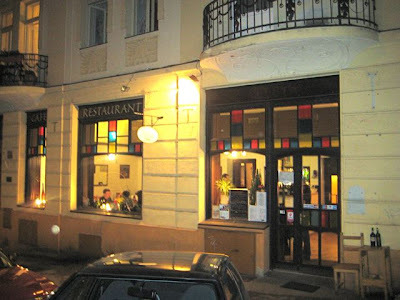 Hard to believe, but it has been more than a year since we first visited Osteria da Clara in Vršovice. That was shortly after it opened. It's a small, Tuscan-inspired place just around the corner from our flat. The British chef and owner, Glen Svarc, used to live and cook in Florence. But he has Czech roots. We've eaten there many times over the past year, but the menu changes every few months, so it always stays interesting. Some things we didn't love. But there have been a number of dishes that I have severely missed after they were taken off the menu. So, when I saw the menu once again had a couple of our favorites from when the restaurant opened, we headed over. And we were turned away. 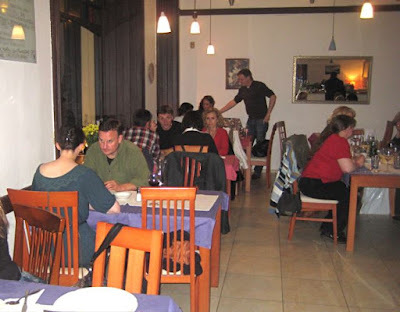 This restaurant, with more or less eight tables, is quite often full now. It wasn't that way in the beginning when I first wrote about it, but it has gotten a lot of positive press, including from the very popular Czech food blog, Cuketka.cz. I wouldn't advise showing up without a reservation, especially on the weekend. However, we did turn up without one on another night. We were lucky and scored the last free table. Soon, the breadbasket arrived. It contained wonderful warm focaccia and some sliced quality bread. The focaccia, lightly sprinkled with salt and rosemary, came with an assertive olive oil. This was not available on our very first visit. I find it irresistible and have a hard time not ruining my appetite by consuming too many slices while waiting for food. Which leads me to another thing you need to be aware of. When the restaurant is busy, the kitchen and the service can really slow down. Patience is required. 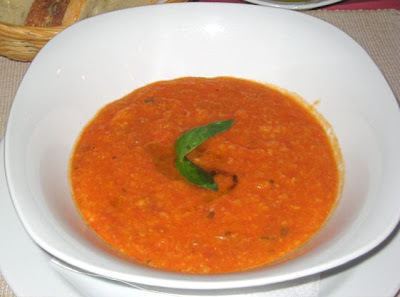 We started by sharing a bowl of the soup of the day, tomato bread soup (85 CZK). It was a large portion, and they thoughtfully split it into two bowls for us. It was creamy and the flavors were very balanced. Just the right amount of salt brought up the essence of the tomatoes nicely, along with the basil. The little pieces of soaked bread gave it a pleasant texture and substantial heft. It was almost a meal in itself. 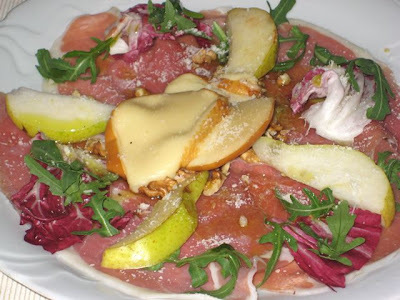 On a second visit, I tried prosciutto, scamorza, pere e noci, otherwise known as Parma ham, smoked cheese, pear, walnuts, rucola, and radicchio with lemon and olive oil (115 CZK). Fantastic. The Parma ham was fresh, moist, and tender. It was a very generous portion. The buttery slices melted in my mouth. The warm, gooey mozzarella-like cheese was a decadently delicious companion. Perhaps it was luck, but the pear was the sweetest I can remember. My biggest regret was that there were only four slices. I cut it into small pieces and rationed them out so I could have some with each bite. 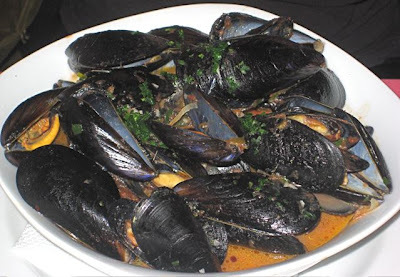 On that visit, V had zuppa di cozze -- mussel soup (139 CZK). She said the mussels themselves were just OK. They were clean, but some were on the small side, perhaps because the season had passed. No "r" in the month of May. However, she really enjoyed the tomato-based both under the shells. It was strong, very garlicky, and spicy. The soup had the flavor of the mussels and the sea. There was a slice of bread soaking at the bottom of the bowl. 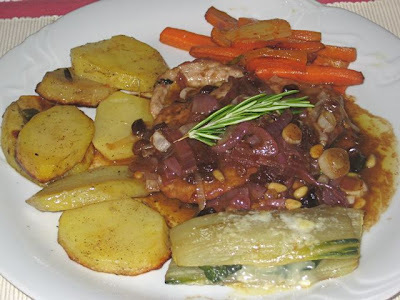 For a main course, I had one of my all-time favorite dishes, the fettine di maiale in saor -- pork fillets with pine nuts, raisins, caramelized red onions and balsamico (259 CZK). It lived up to my fond memories. The three pieces of pork were pounded flat and very tender. They were dipped in flour and cooked in wine. Very rich. I like dishes with sweet notes. This was perfect for me. But V's tastes don't always run in the same direction. As I was raving about how good it was, she teased me. "Flour, butter, sugar, nuts. Cake." On the second visit, I thought ordering something I hadn't tried before might be better for you, the reader. 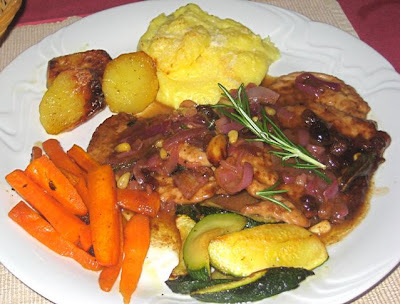 But me, the eater, couldn't resist another chance to have the fettine di maiale. But this turned out to be an educational choice for us both because it came out differently than other visits. This time, the chef had a heavier hand with the balsamic, moving it more into the sour camp than the sweet. I preferred the way it was the first time. Also the vegetables changed on different nights. Both times there were sliced potatoes and carrots. The carrots are some of the best I've ever had. They were cooked in Marsala wine and have a smokey flavor that I think comes from pancetta. They still had some crunch. Good for the health, but I don't want to know how much butter and olive oil they go through every night in the kitchen. One time, there was zucchini. Another time there was fennel. You never know what you are going to get. But I appreciate that the vegetables are included in the price of the main course. No extra add ons for side orders. 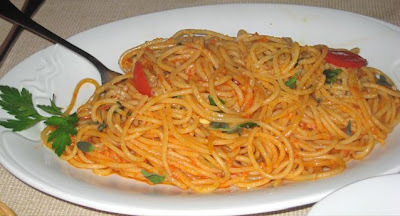 V ordered a favorite dish from a year ago, the spaghetti alla zingara (139 CZK). This pasta excited her the first time she tried it because of the fresh ginger in the mix, a non-classical but creative idea. Per the name, it has a spicy zing. This time, she didn't love it. She wished for more sauce, there was too much olive oil, and it was slightly overcooked. That said, the portion was huge. She could only finish half at dinner and took the rest home. But there have been pastas on the menu that were really terrific. One was on the menu a couple of months ago -- a penne with tomato sauce and Italian sausage. It was perfectly al dente. I had actually planned to save some of it for lunch the next day, but I enjoyed it so much, I finished the whole thing. 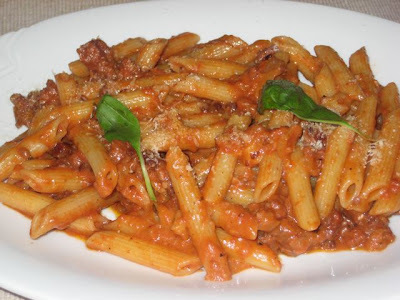 And I need to mention another penne dish from a previous menu that I still dream about. It was made with mascarpone cheese, pumpkin, and pancetta. Creamy, savory, and sweet. "It's dinner and desert," was my enthusiastic assessment after I had cleaned the plate. I can't wait for it to appear again. 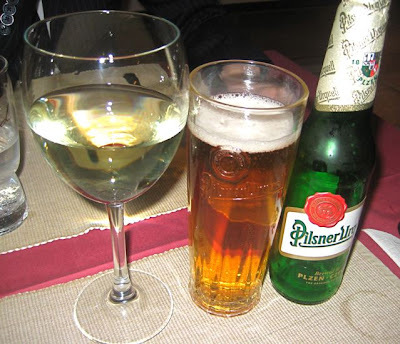 I usually drink Pilsner Urquell. They only serve it in .33 liter bottles (35 CZK). Bottles of Mattoni mineral water were 30 CZK each. V had one of the house white table wines (35 CZK per glass). The wine list is one of the really great things about Osteria da Clara. It is all Italian, the prices are relatively low, and we've had quite a few good ones. The cheapest on the list was 195 CZK and the most expensive was 595 CZK. But there were also wines by the pitcher -- .2 liter, .5 liter, or 1 liter -- that are even better bargains. 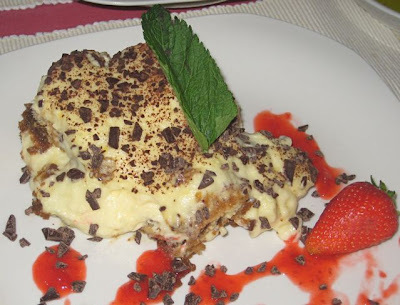 For dessert, we shared a house-made tiramisu (99 CZK). Loved it. The topping was so light, I was doubting that was mascarpone. The savoiardi or lady fingers were soaked in a strong espresso. There were chocolate chips and a drizzling of strawberry syrup. Above all, it was not too sweet. 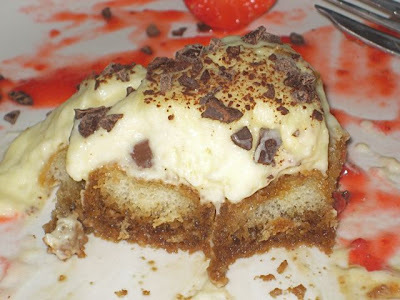 What was most interesting is V does not like tiramisu. I expected her to take one bite and the rest would be for me. But she thought the flavor and texture were quite special. She ended up consuming her full share. Not content with one sweet ending, V ordered us two shots of Becherovka as a digestif (60 CZK each). 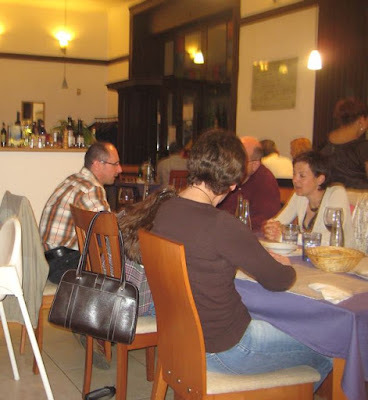 Even though it is outside the tourist center, I regularly recommend Osteria da Clara. Two well-traveled colleagues raved after I sent them over. A diplomat and his wife loved it. My stepfather seriously wanted to eat there every night. After all my referrals, only one person came back not appreciating it. Just don't raise expectations to unrealistic levels. As noted above, it is not perfect. Not every dish is a winner. Service can be haphazard. The kitchen is not always consistent. But there is a large share of quality. It's clear the chef's heart and soul is in his work. I've found nothing else quite like it in the city. And along with original and often delicious dishes, Osteria da Clara has one more key ingredient -- great value. It's a place that this writer repeatedly returns to, admiringly, again and again. It's hard enough to get a table at Da Clara without a reservation as it is! Now look what you've done! Seriously, I'm really glad that Glen's doing so well. I was deeply worried about Da Clara's future when they opened considering that my spouse and I were often the only couple in the place, so we'd deliberately try to eat there weekly so as to support it. Oh man! Those pictures! Luckily I am just after lunch. When you mentioned all the olive oil... I think Imam would have fainted. Btw. regarding previous discussions about Sbarro, I think it is a good thing you are not above regular places. 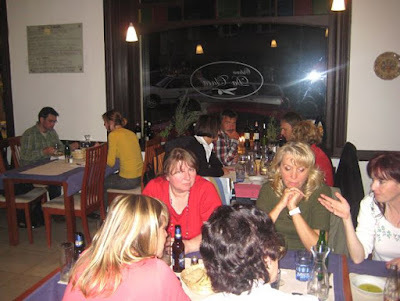 You may want to try the greek takeaway with 4 chairs on Slezska close to nam. Miru, it is in your vicinity and it is pure goodness. thanks for the write-up about Osteria. I've been there twice with friends, and we've all enjoyed our food there.